9MRS is a polyurethane bonded abrasive wheel for glass polishing (edges) using straight line or double edge grinding machines. 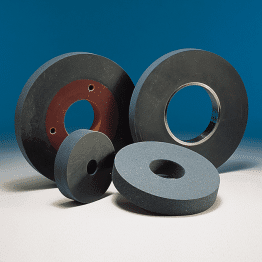 The combination of a medium to high porosity polyurethane bond which is friable with high quality abrasive grains produce an abrasive wheel that is self dressing (cleaning) and produces a high quality polished edge on all glass types. 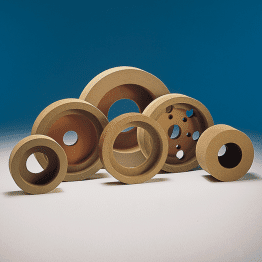 Higher porosity than our 9MR grade makes this product physically lighter and more suitable for machines operating at higher rpm or on thicker glass. 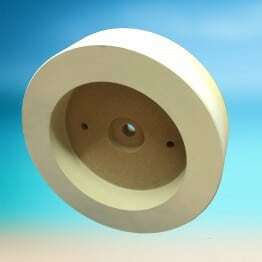 9MRS is easy to set up and use on any glass grinding machine. G-flex products are particularly suitable for work on stainless steel, including de-burring and blending of welded joints/connections. 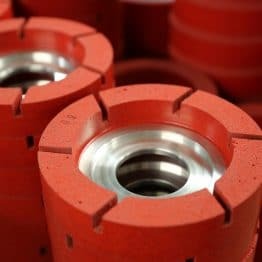 This grade of product produces low hand/arm vibration values, is easy to control and can reduce the time required for subsequent polishing operations used mops and compounds.